Thanks to funding from the State Library through the federal Library Services and Technology Act, much of this first series is available online via DocSouth at UNC-Chapel Hill. 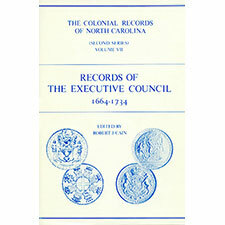 In 1963, a new series of Colonial Records was launched. The inaugural volume of The Colonial Records of North Carolina [Second Series] printed the key constitutional documents of early Carolina, such as royal charters and the Fundamental Constitutions. 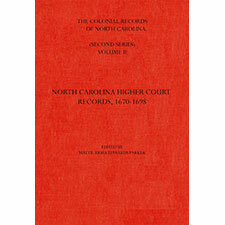 Volumes II-VI focus on records of the various higher courts in the colony to 1730, while volumes VII-IX concern the Council, the body advising proprietary and royal governors on the exercise of their extensive powers. The documents in volumes X-XII will tell the story of the Church of England in colonial North Carolina. 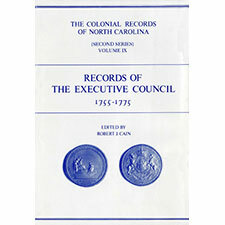 Subsequent volumes will have as their themes the governorship of Arthur Dobbs (1754–1765); and the Regulation, the important sociopolitical movement of the later colonial era. 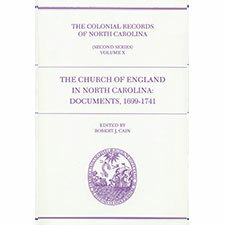 The latest venture in the Colonial Records Project is the publication of a series of softcover titles featuring selected documents on themes such as society, piracy, warfare, religion, slavery, Indians, and the family, among others. It is envisioned that these publications will be of use to established scholars, and also suitable for introducing students to the richness of early North Carolina’s documentary legacy.